There is something very honest about a garden. When you stand in a garden and look at the fruits thriving all around you, know that you are witnessing the fruits of labor. Soil had to be turned. Seeds had to be buried. Weeds had to be pulled. A garden only reflects the work that is being put into it. It doesn’t cheat or misrepresent itself. 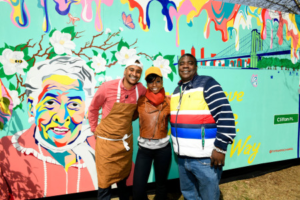 A couple of weeks ago, environmental nonprofit GrowNYC, in partnership with TBS, NYC Parks and Councilman Robert Cornegy, renovated the Hattie Carthan Community Garden. The garden was founded by Hattie Carthan, a pioneering environmentalist known for replenishing the Borough of Brooklyn in the 70’s with Magnolia trees. The renovated garden now boasts dozens of new garden beds, new benches and a wonderful new mural featuring Mama Hattie herself. 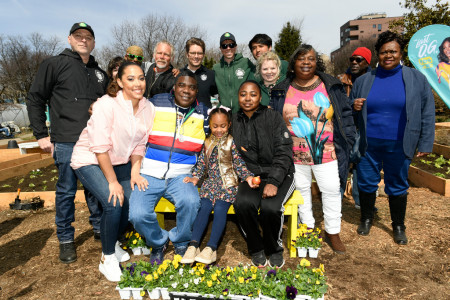 To introduce the renovations, TBS bought the star of its show The Last OG, Tracy Morgan, back to his hometown to present the garden back to the community. Connecting a star like Tracy Morgan to a community garden is a great visual for children to see, it’s a connection between the earth and what they see on television, proof that you can be good at what you do and care about where you are from. And that was really the best part of the day, seeing the children react to having a star in their neighborhood. For Tracy though, doing the right thing is still about pleasing the woman that raised him. “My grandmother would be proud of me right now.” That’s an honest statement for any Black man that grew up the way we did in Bed-Stuy. We all want our grandmothers to be proud of us.